Earlier I had blogged on violet tunic here. 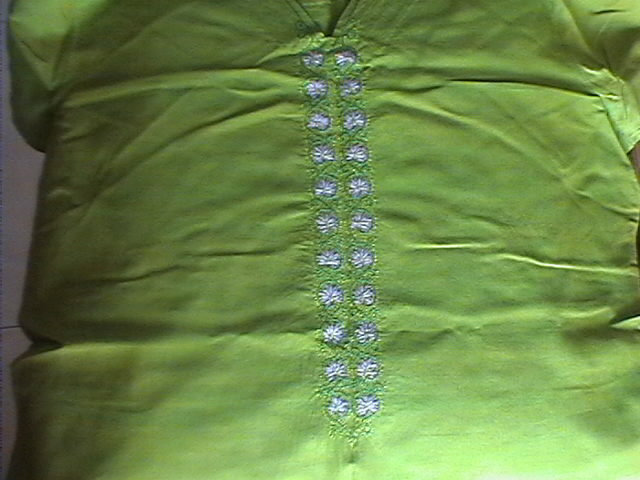 The embroidered yoke and sleeves are taken from this green tunic. I did not know I had the pictures of this earlier tunic. Here also , the picture is not of high quality. The embroidery done in self colours- the reason is the dupatta[scarf] was bright block printed lemon yellow. It matched well as a set. 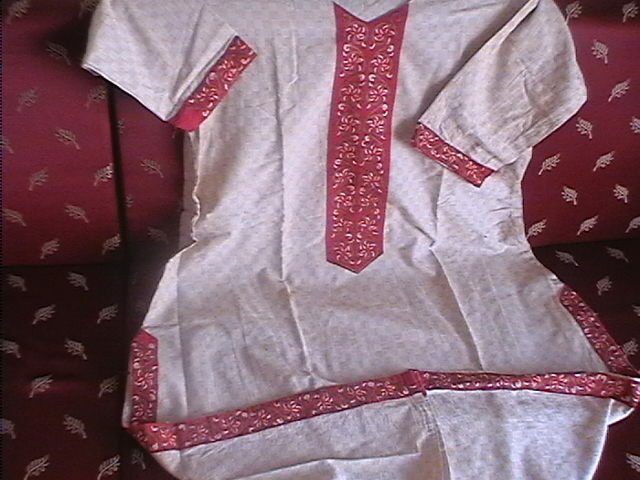 The fabric colour is also a mixture of green and yellow[not clear in the picture]. Embroidery here was just a subtle detail. 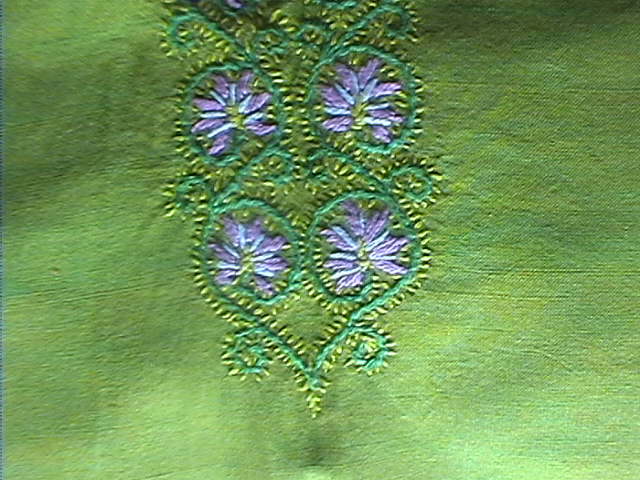 This embroidered yoke and sleeves were done on a green tunic. I had a yellow dupatta for it. 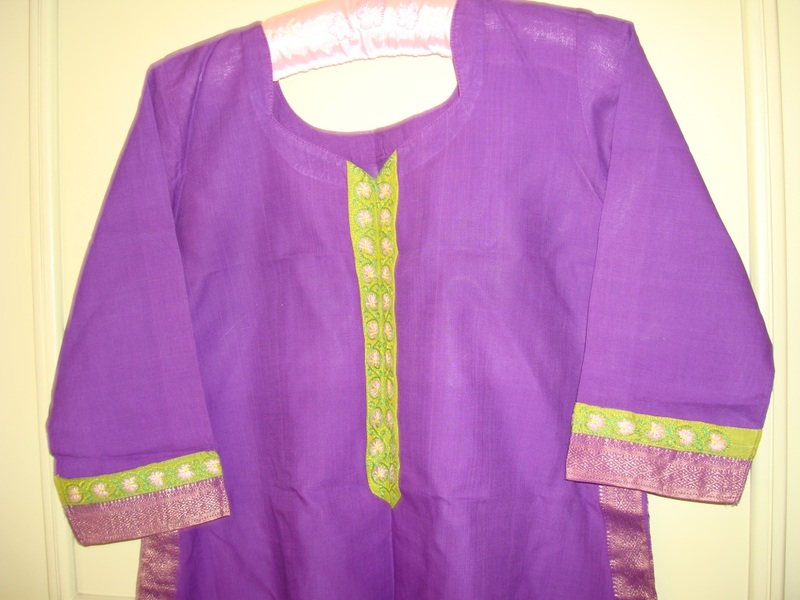 Later I made the dupatta into a short kurthi[top]. 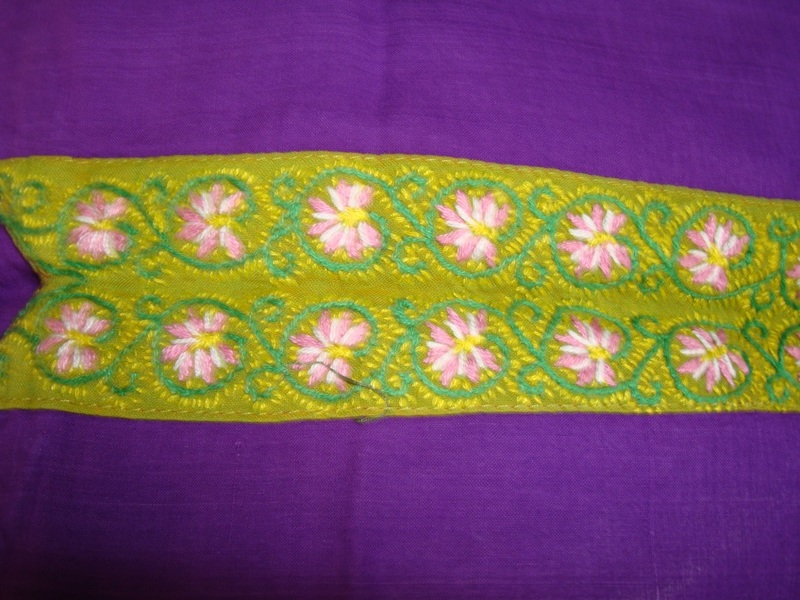 I got tired of seeing this on that green tunic, so when I bought this violet mangalagiri fabric, the yoke and sleeves were attached to it. 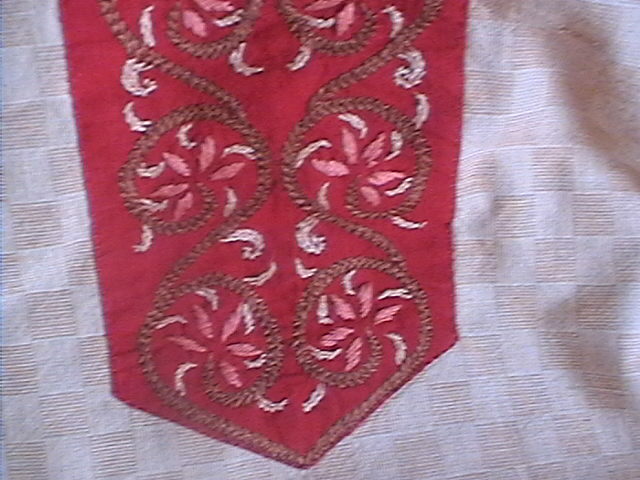 Idea- The idea was to work a type of kashmiri embroidery, which is delicate and fills the whole area. the stitches generally used are stem, cretan, straight. The pattern- the patterns used in these embroidery are florals,I drew a creeper pattern. Embroidery- the whole piece was done in two strands of cotton skeins.straight stitches in pink and white for flowers, stem stitch in green for veins, and small straight stitches in yellow as fillers. Here is another example of how the colour contrasts work on a tunic. I want to explore more on this embroidery type and I am yet to start. About the Pattern-Earlier I thought this as a curved creeper pattern , recently learnt this type of pattern has a name- Arabesque. I getting familiar with this new term. I made the border for yoke, sleeves, 2 slits. It took a long time. .For the stem and leaves, I did not have cut and start over, but the flowers had to be done individually. This experience is always there with me when I choose the pattern and colours. I try to avoid this wherever possible , without compromising the effect. Ten tears ago, the style was to wear long tunics, now it has changed, they are shorter now, but it was destined that I should learn my lesson on this long tunic.